Bugatti presents a special edition Bugatti Veyron 16.4 Grand Sport Vitesse in a unique Bianco and New Light Blue colour scheme at Volkswagen Group Night only. 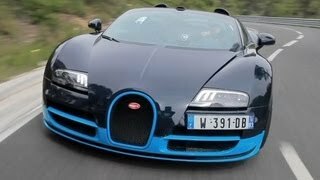 The Bugatti team has managed to transfer the world's most powerful car engine to the open-top sports car while taking all vehicle dynamics and aerodynamic parameters into consideration. 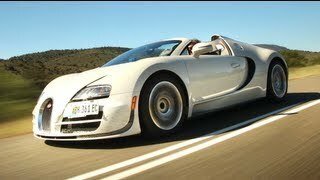 The new Bugatti Veyron 16.4 Grand Sport Vitesse boasts a remarkable maximum torque of 1,500 Nm (at 3,000-5,000 rpm) from the 7.9-litre capacity of its W16 engine. The maximum output (1.200 hp) is reached at 6.400 rpm. These figures allow the car to reach 100 km/h (62 mph) from standing in unbelievable 2.6 seconds. The top speed of 410 km/h (255 mph) makes the four-wheel drive (like all Veyrons) Grand Sport Vitesse the fastest production roadster ever.